Jewelry music boxes make a perfect gift for flower girls as a favorite reminder of your big day and they special role they played in it. Musical jewelry boxes inspire a lifetime of jewelry collecting and care. 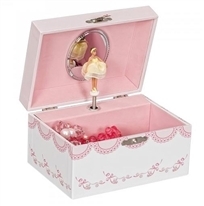 Our flower girl collection features musical jewelry boxes for girls. Visit our girls jewelry box category for non musical jewelry boxes. Questions on our little girls jewelrymusic boxes? We welcome your call or email. A keepsake jewelry music box will be treasured by the little girls on your gift list!